Troyer Ridge completes their Berkshire Bedroom Collection with this One-Drawer Nightstand that is the ultimate complement beside the Berkshire Bed. The clean-lined and transitional style of this nightstand means it can complete the look of a master's bedroom, or become a nice additional piece to the guest room. Whatever style or room chosen, you will make sure to keep this nightstand on your favorite side of the bed. - The top portion of the nightstand provides plenty of space for your early morning alarm, glasses, jewelry, and other bedside essentials. - The Berkshire One-Drawer Nightstand also provides plenty of storage space below that consists of a single dovetailed drawer, along with two storage compartments, which are perfect for storing magazines and books. - It can also be easily customized, as the One-Drawer Berkshire Nightstand can be built using different types of woods, finishes, and hardware. Troyer Ridge Furniture employs only the best Amish craftsmen around to build their furniture to ensure a quality build that will last for many years. Each One-Drawer Berkshire Nightstand is handcrafted by Amish woodworkers from Ohio who use only the finest hardwoods and catalyzed finishes. This nightstand is sure to be by your bedside for the rest of your life! 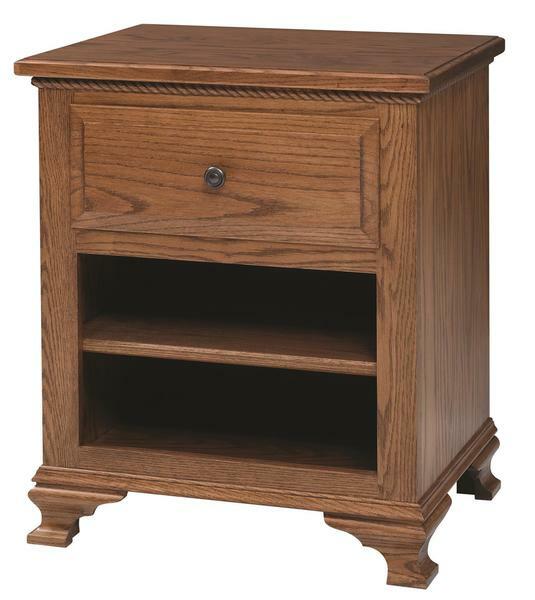 If you have any questions about the One-Drawer Berkshire Nightstand or would like to order online, feel free to call and speak to one of our Amish Furniture Specialists today at our toll-free number 1 (866) 272-6773. They are eager to help out and point you to exactly what you are looking for! You can also get in touch with one of our furniture specialists through email at Questions@DutchCrafters.com. We look forward to hearing from you soon, and appreciate you shopping with us!